"Bring back the Windows XP start menu by using Spencer." Many users were not very happy when they first started using Windows 8 and realized there was no longer the start menu they knew and loved from the older releases of Windows. With the new Modern UI, for some users, it feels inconvenient compared to the retro start menu and many started looking for ways of bringing it back so they don't have to feel inconvenienced when they attempt to find their installed applications. The SZ Development decided that they preferred the classic start menu from retro version of Windows, such as Windows 2000 and Windows XP, much more than even the start menu from Windows Vista and later. And now, with the release of Windows 8, the start menu is gone altogether to make way for the Modern UI and it's application menu. With Spencer start menu, you can get your classic start menu back in it's retro state known from Windows 2000 and Windows XP. 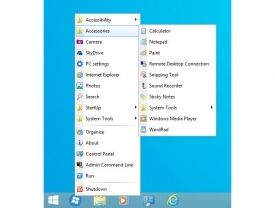 The Spencer start menu doesn't replace the Windows 8 start menu, but it is just an alternative and a convenience for when you want to find the applications you have installed and want to use with the old method rather than with the new start menu interface. The application does not need to be installed - once you execute it it'll run quietly in the background with an icon on your taskbar (which you can also pin to your taskbar to make it a permanent addition). Once you click on this icon in the taskbar, the retro start menu appears right on top of the icon and ready to take your mouse commands. Just like the retro start menu, you simply mouse over the categories and folders you want to view and open, and easily get to the applications that you want to use. A lot of veteran users feel Microsoft already had it right with the old start menu and it's easy to use functionality, and that the new start menu interface over complicates a simple function that was already on Windows from the start. 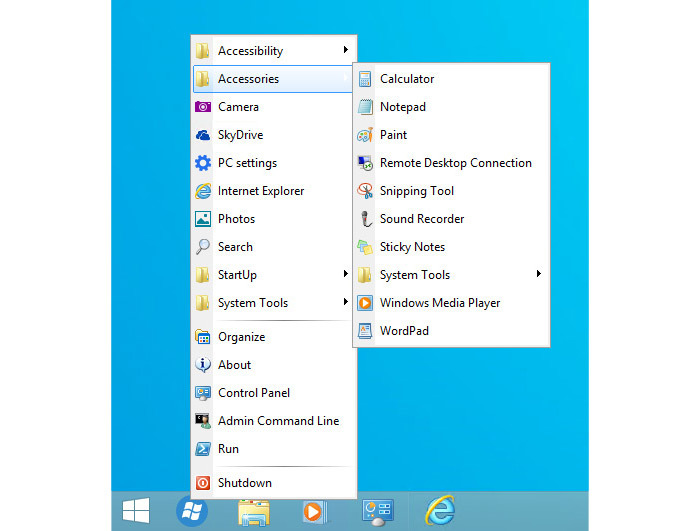 With Spencer start menu, these users can now find their programs and execute them just like they used to. It is worth highlighting that this is NOT a start menu replacement. It is an application that runs in the background and is meant to be pinned to your taskbar for when you want to use the retro start menu. The Windows 8 start menu will still be a part of the operating system and will be continue to be available at the left of the taskbar like it always has been while Spencer runs quietly in the background.